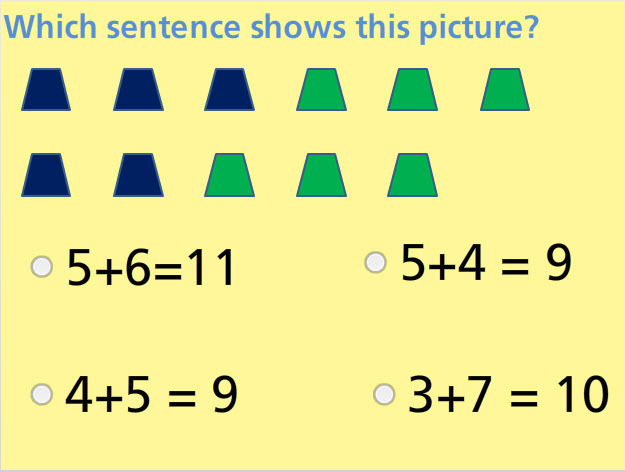 Identify addition sentence that is modeled by a set of pictures in this interactive math test. This test is made up of ten problems: seven multiple choice and three drag-and-drop problems. In order to show continued progress in basic mathematics, this online test is an entertaining way to show how well the student has grasped the concept of addition up to 20. Return from this Addition Sentences for Pictures Math Test to the Elementary Math Tests , 2nd Grade Math Tests webpage, or to Math Tests.